According to the famous legend of king Arthur, the wise wizard Merlin was born in a cave in Carmarthen, and according to said legend as soon as a certain tree named after the wizard falls down, so will the town. The tree happened to die a long time ago and pieces of it reside in the town’s museum, but the town itself is more thriving than ever. Boasting both picturesque views and a busy town centre, the addition of a shopping centre in 2010 proves that this is a town on the move. Like Carmarthen, we believe that hog roasting is really going places. Having catered to countless events all over the country, it is no wonder than hog roast Carmarthen is yet another town on our client list. Providing full event catering with full menus and waiting staff, hog roast machines and chefs and or simply just the machines themselves, we are experts in hog roasting and a sure choice for catering at your event. The ancient method of cooking meat on a spit has roots hard to trace; as it is such a good way of cooking, it is not hard to believe that humans have been doing it since our species began. However, hog roasting itself is most related to the Middle Ages, where it is often depicted in art and books of the time. The main attraction at the time was that this method of cooking could feed large amounts of people at once, cooking an entire pig easily on a spit to feed guests at banquets or large groups of people. Most will think of the dinner tables of kings and queens. The method of cooking meant the pig had to be turned constantly throughout the cooking to make sure all the meat was cooked equally. Our machines don’t require any elbow grease with hog roast hire Carmarthen; the motor is powerful enough to cook some real giants of the pig world, turning them constantly so that every inch becomes crisp and delicious according to our high standards. You don’t need to be hosting a medieval banquet to need a hog roasting machine either; we have catered for events as small as ten people. Talk to us before-hand, and we will deliver you a locally-sourced hog with the machine appropriate in size to the size of the event. We don’t believe that any pork should go to waste, and anything left over we are perfectly happy to carve off for you so you can keep it for yourself; though in our experience, guests are very keen to have seconds and you’d be amazed how quickly a huge hog can be eaten by those coming back for more of the delicious taste. We are not limited to just roasting hogs, despite the name! We can cook pretty much any meat you can think of with a variety of add-ons and tools which are easily fitted to the machines. We’ve done chickens, beef, legs of ham, and even more exotic animals like pheasant and goose. Multiple birds can be cooked at the same time on the roasting spit in much the same way as the hog. Though we specialise in hog roast catering, we are not limited to just that. When we cater for your hog roast Carmarthen event, we can provide some delicious meat-free, dairy-free or gluten-free options for your diet-restricted guests. With delicious starters, mouth watering mains and tempting puddings we have a range of food in our repertoire and are eager to discuss the menu with you. The menu examples shown here on our website are just a taste of what we can do; change anything you like! We are passionate about making your event go off with a bang, and know how important food is to really bring something to a party or celebration. 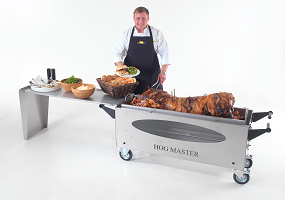 And what better to do that than a full roasting hog at the centre of your event? One of our most popular hog roast catering options is our rolls option, which suits the buffet style of event very nicely. Beautifully roasted pork is sliced from the spit before you and placed in our signature floury buns with a generous dollop of apple sauce. This is a sure crowd pleaser, on sleepy summer evenings and cold winter afternoons alike. And any pork that’s left after your guests are full can be carved off for you and placed out with a selection of sauces for anybody feeling peckish later. We rarely have reports of anything being left over! So whether you chose our full catering, small event catering or hog roast hire Carmarthen you can be sure of efficient service and happy guests!